From facing closure to getting a facelift, High Park Zoo not only continues to bring people closer to nature, it now has improvements in its future. Plans for the zoo’s future improvements were unveiled to a room of eager volunteers and nearby residents, Thursday, Jan. 28, receiving a positive reception. Friends of High Park Zoo (FHPZ) chair John Formosa, along with landscape architect Brent Raymond of the firm DTAH, unveiled the design of the High Park Zoo Master Plan, to a small audience and everyone seemed pleased. The zoo enhancements range from the large, such as increasing the size of the bison pen by seven-metres and creating a new administrative building; to the small, such as improving lighting, installing flags and signs so that the zoo is more noticeable, and improving the overall plant quality. The master plan also looks to improve the zoo experience for the animals as well with new creative furnishings for them to enjoy such as ponds and interactive feeders. Although the master plan isn’t a formal city project, the FHPZ, a community and volunteer driven organization that’s launched this initiative, is working with the City’s Parks, Forestry and Recreation department, to enhance and sustain the zoo. For the chair of the FHPZ, this master plan shows true growth and the neighbourhood’s love for the zoo. It’s a great example of what communities can do. The zoo will have to tackle some major improvements such as creating a colourful main pathway that is accessible, improve stormwater management and enhance the gateway to the zoo all while maintaining its park feel, Raymond said. Keeping the zoo’s profile fairly demure is something Andrew Kohan of India Road and Garden Avenue believes the landscape architects did well. I love it. I love that it expands space for the animals and makes the space for the people better. 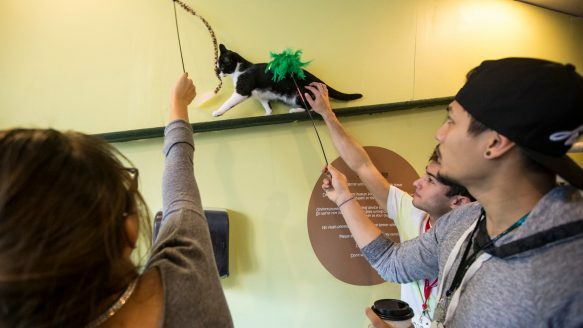 It’s a much more humane space in many ways for both visitors and residents of the zoo. The next step in the master plan process is to take feedback and comments from residents and make any necessary changes. Following that, the group will determine overall costs and determine which projects have the highest priority and when should they happen. The plan will set out improvement projects in phases. Farmosa said, the FHPZ will also be lobbying all levels of government, foundations and corporations for funding in the near future. As the awareness (of the zoo) grows, people are showing that it’s a worthwhile investment and a worthwhile asset for Toronto to keep and really improve and bring up to date. There is no set date for when improvements in the zoo will start. Torontob s dwellers love an animal story. Hereb s a look at the yearb s top headlines. 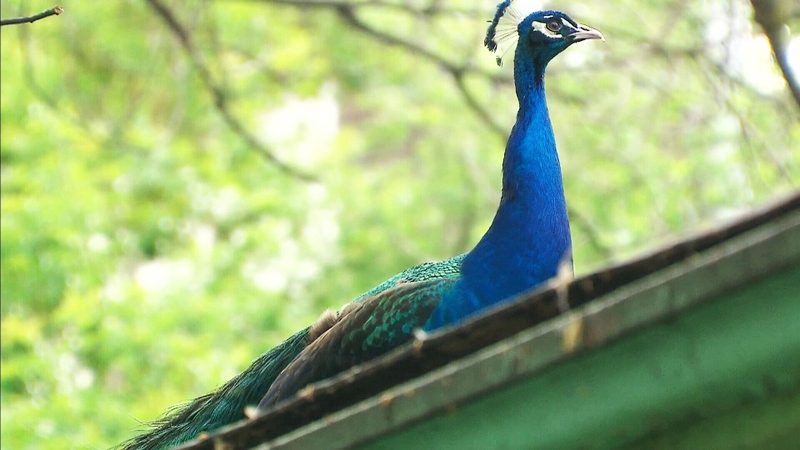 A peacock from High Park Zoo was spotted in the Parkdale area, flying from house to house. Over the years, Toronto has been home to animal stories that tend to break the internet. Remember Darwin the Ikea monkey? Remember when the city mourned a dead raccoon? In case you didnb t already know, Toronto is probably the raccoon capital of the world, which makes it no surprise that itb s also the home city and final resting place of Conrad, the critter at the heart of #DeadRaccoonTO. In July, Torontonians found his carcass downtown and soon tributes flooded in b  and not just on social media. A makeshift memorial of flowers, cards and candles soon formed around Conrad as the citizens waited for Animal Services to collect the body. 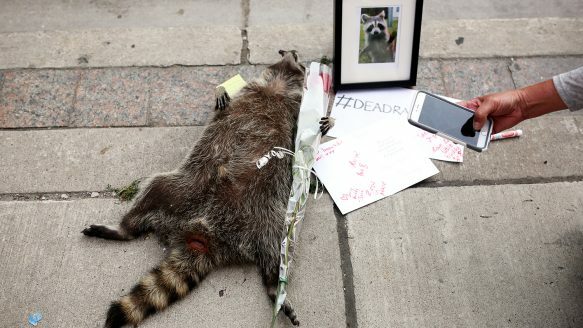 Rest in peace, #DeadRaccoonTO. This Toronto peacock spent five days running through The Six evading authorities. Roncesvalles neighbours witnessed him hopping rooftops, galloping down streets and narrowly missing capture by animal services. Why was he running? He may have been looking for love, or maybe he wanted a taste of freedom or perhaps he just wanted to watch Drakeb s concert (that was Norm Kellyb s guess). 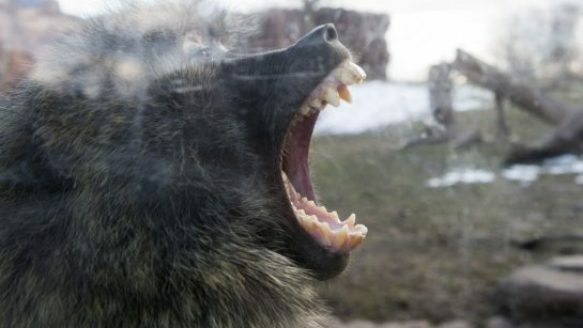 It was like the real-life version of b Planet of the Apes.b  Since the matriarch olive baboon died last year, the females have been fighting for the throne. Zoo officials were forced to close the exhibit for several days due to the injuries which included deep lacerations, hair ripped out and tail injuries. Reporting for duty, Officer Groundhog! Heb s probably the cutest police recruit of the year. Toronto police showed off their new member during the Pan Am Games. Officers said training began immediately after he befriended offices at the Exhibition Place in July. Teacher Sharon Douris brings her pet hedgehog Henley to Kew Beach park where Henley visits his home away from home at the base of a Maple tree and visits with the local children. Local hedgehog Henley stars in a childrenb s book series and has his own lovable jingle that youb ll never forget. Watch the video above to hear the song and learn about how elementary teacher Sharon Douris came up with Henleyb s magical tree house in Kew Gardens. 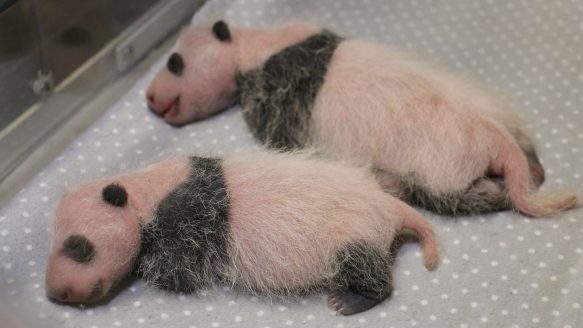 Er Shun gave birth to two panda cubs, a first in Canadian history, in October. Due to the difficulties around breeding pandas, the mom, a giant panda on loan from China, was artificially inseminated in May. Reports from October say the cubs were healthy and starting to develop black markings, fur and pseudo thumb pads. Awww! The long-awaited cat cafC) opened its doors to the public in November. All the cats at the cafC) are available for adoption through the Toronto Humane Society. 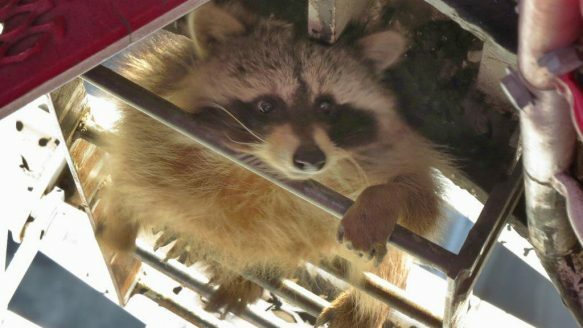 Who do you think was more surprised: The crane operator who found the raccoon that climbed 213 metres up a crane or the furry rascal who figured out he couldnb t fly? Toronto released security video of raccoons attempting to tamper with newly designed green bins. The video shows just how tricky these midnight bandits are. Cute from afar, we say. Crowds of film fanatics and tourists line the streets of Toronto during the Toronto International Film Festival and the raccoons could not care less. Unless youb re in their way. The AGO expansion, ROM crystal and High Park Zoo are projects that were the result of philanthropy. A concept drawing for Project: Under Gardiner, a $25-million plan to convert a stretch of land beneath the Gardiner Expressway into an urban park. City organizations like Waterfront Toronto are changing how they do business in order to accept more charitable gifts like the $25 million pledged this week for a new linear park beneath the Gardiner Expressway. Philanthropists Will and Judy Matthews donated the money for “Project: Under Gardiner,” a plan to add walking trails, gardens, markets, and skating facilities to a 1.75-kilometre strip of land under the elevated expressway between Spadina Avenue and the CNE. Waterfront Toronto will be in charge of delivering the project, but CEO John Campbell said his organizationbs current structure requires the Matthews’ money to be funnelled through the city first. That’s a potential barrier to philanthropic city building, he said. “There are people out there that want to contribute, you’ve just got to make the vehicle to make it happen,” Campbell said. We want to use this as a bit of a seed to prompt that idea, so we’re going to be applying appropriately to create a separate vehicle that will allow [donations] to happen directly. Mayor John Tory hopes the Matthews’ unprecedented donation will inspire other wealthy Torontonians to contribute to the city’s development. The first phase of Project: Under Gardiner will be built on city-owned land between Strachan Avenue and Bathurst Street by July 2017. Torched by vandals in March 2012, the play area in High Park was rebuilt and improved thanks to more than $140,000 contributed by various groups, including Canadian Tire, TD Canada Trust, Lowe’s, the Toronto Parks and Trees Foundation, and the philanthropic Sprott Foundation. 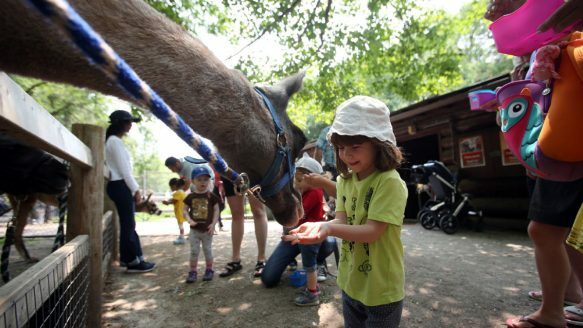 In 2011, city cuts removed funding for the popular High Park Zoo. Non-profit group Friends of High Park Zoo raised $270,000 and partnered with the Honey family foundation to match community grants up to $50,000. A private donor also contributed $30,000 towards keeping the zoo open into the future. Michael Lee-Chin’s name was added to the famous crystalline entrance to the Royal Ontario Museum as thanks for pledging $30 million towards the $300 million expansion. A Globe and Mail investigation published in March found Chin and others were still yet to completely fulfill their promises. Businessman Kenneth Thomson contributed $50 million towards the AGO’s $170 million Frank Gehry-designed expansion and renovation, as well as a sizeable chunk of his own art collection, which included The Massacre of the Innocents by Reubensbone of the AGO’s most valuable works currently on public display. Friends of High Park Zoo (FHPZ) launched the High Park Zoo Master Plan. One of the many reasons the High Park Zoo is so loved is its location in a ravine that makes it a quiet space that doesn’t feel like it’s in the middle of a thriving metropolis, say local residents. Its inhabitants b the llamas, barbary sheep, bison, peacock, emu, mouflon sheep, yak and reindeer b are the main attraction for the 570,000 visitors the zoo receives each year, yet there is a lot that could be done to improve the zoo’s exhibits and overall public appearance. 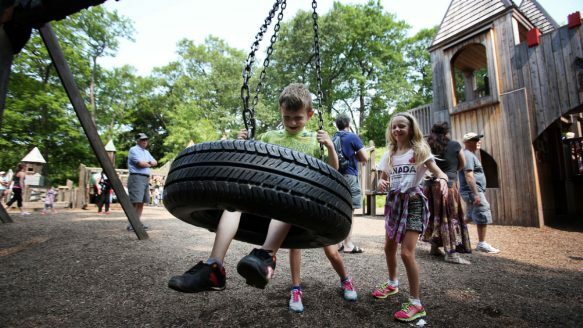 That’s why the Friends of High Park Zoo (FHPZ), a community and volunteer driven organization, has launched an initiative, the High Park Zoo Master Plan, alongside the city’s Parks, Forestry and Recreation department, to enhance and sustain the zoo. Whatever you think is a good idea, bring it forward. Webre not here to make a decision tonight. We want to talk about the possibilities. A Master Plan is a tool to help implement a vision and used as a fundraising tool, Raymond explained to the couple dozen community members, who attended the meeting hosted by FHPZ. The Master Plan will be defined within a relatively short period of three months because it will coincide with the reconstruction of Deer Pen Road b the public access to the zoo pens. It is in need of repair; there are storm water drain issues and tree roots breaking through the sidewalk, Raymond said. Working with Raymond and DTAH is Paul Harpley, who specializes in zoo exhibit planning, design and interpretation. Residents were tasked with answering three specific questions among themselves: What place or feature do you like most about the zoo; what place or feature would you like to see improved at the zoo; and what additional feature would you like to see in the zoo Master Plan? Better signage was a suggestion that came up several times. Parkdale-High Park Councillor Sarah Doucette, who spoke on behalf of her working group, suggested animal footprints be painted on paths to indicate where the zoo is within High Park. Improved fencing that would allow visitors to get even closer to the animals, a petting area not just on weekends and more interactive features were just a few more suggestions. In January of 2012, the zoo, which had been built in 1893, was threatened with closure when the city proposed pulling its $228,000 annual operating costs. That’s when the FHPZ formed to save the zoo. The group opened the llama pen to visitors who for a small fee could feed them, and raised $11,000 in one week. Thanks to groups like The Honey Family Foundation, the Griggs Family Foundation, and individual donors, the zoo was saved and on-going fundraising efforts are continuing to fund its sustainability and enhancements. Lisa Rainford is a reporter with the Bloor West Villager. She can be reached at lrainford@insidetoronto.com. Follow the Villager on Twitter and Facebook. It isn’t the landscaped space that makes a park a glorious place, it is the work and activity and passion of everyday citizens. Take the west ends beloved High Park, where this essential truth comes to life all around you. Earlier this year, I was in High Park with my family to participate in a parade. All the T-ball and baseball players in the kids league there kick off the season by marching in uniform behind a bagpiper, then line up on the baselines for the ceremonial opening pitch and presentations of trophies from the past season. It’s a fun bit of formality, and it doesn’t happen by accident. 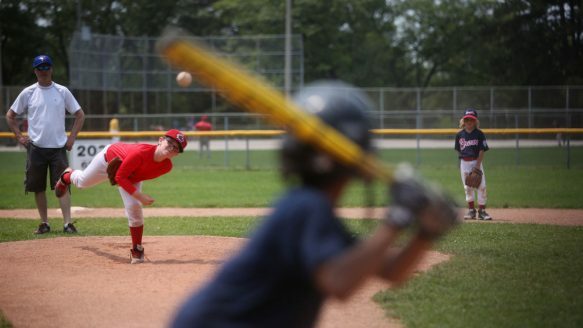 Batter up: Brady Walintshcek, 10, delivers a pitch at Ernie Keith Field, home to the High Park Baseball Association. The organization has been operating since 1952, winning the provincial Little League championships 16 times, and representing Canada at the Little League World Series four times. Last season the 12-year-old team lost in the national finals to Vancouver. During the proceedings, volunteers were given service pins b one coach of an elite rep team was recognized for 25 years of work in the league. A convenor got up and talked about how parents and supporters had raised money and put in volunteer labour to install a new warning track along the home-run fence. If part of what makes summer in the park special for my family is the baseball community we participate in, webre indebted to a group of people who organize it and make it happen. All around us there were other little societies and subcultures using the park: people crowded around the blossoming cherry trees, which were a gift from the Japanese government and are promoted by a non-profit park fund; a kids’ soccer league played on the field nearby; there was some kind of running event taking place along the roadways; children romped in the Jamie Bell Playground, a maze of castlelike structures originally designed by local schoolchildren and rebuilt with volunteer labour and donated money a few years ago after a fire. was built in 1998, it was based on designs and featured artwork from local schoolchildren. When it was burned down by arsonists in 2012, it was rebuilt within months using corporate donations and the work of hundreds of local volunteers. but they are so much more than that. My front lawn is a green space. The strips of grass at the sides of the highway are green spaces. What makes parks so valuable is the activities that take place in them b the way they are programmed and populated, in ways both planned and improvised, by groups of people. You see this even in tiny local parks, where families leave communal toys behind and share neighbourhood news between turns on the slide. You see it in larger spaces like the celebrated Dufferin Grove, where the volunteer-initiated rinkhouse and pizza ovens became the hubs of neighbourhood revitalization. You see it in regional landmarks like Sunnybrook, where extended families set up loudspeakers during cookouts between cricket matches, or on the beaches where the various rowing clubs, beach volleyball players, sunbathers and swimmers congregate side-by-side, making an urban scene out of a strip of sand on the water. meant to indicate that in Toronto the aim is that all urban space is immersed in a network of parkland. But visit any park and you’ll find it takes on another meaning: like a city, a park is more than a defined shared space; it is society of subcultures interacting in ways that define that space and make it a great place to be. public park for the free use, benefit and enjoyment of the citizens of the city of Toronto forever. 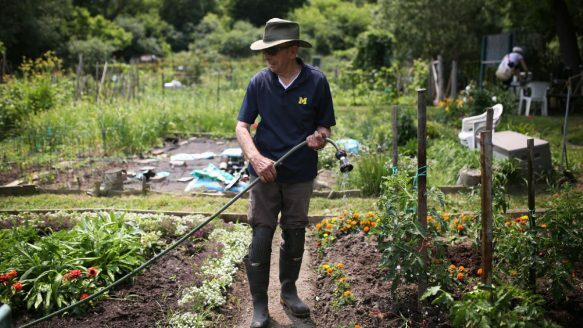 Garden of eating: Retired iron worker John Donaldson waters his garden of fresh veggies, herbs and flowers at the allotment gardens. One hundred and nine plots are rented (for $73.22 each per year) to locals who spend their afternoons planting, weeding and socializing. There’s a long waiting list administered by a volunteer organizing committee. With that founding in a private donation, it has been built up and maintained in the intervening years under the city’s official custodianship with the initiative, dollars and hard work of citizens. When the High Park Zoo faced closure due to lack of funding in 2012, the community raised money and volunteered time to keep it running, and today volunteers put in time on weekends so people can interact with animals in the llama pen. For the love of llamas: The High Park Zoo offers free admission, in keeping with John Howardbs conditions when he donated the land it sits on. In 2012, it was saved from a budget-cutting shutdown by locals, who continue to volunteer to help provide for the emus, yaks, bison and other exotic animals. On weekends, visitors can feed and pet the llamas, as Popy Elia did recently. A self-regulating group of dog owners (the K9 Committee) advocated for the establishment of an off-leash area, and attempt to broker disputes with other park users. It’s a dog’s life: Dogs running free have been a source of tension with other park users, and with conservationists who worry about damage to tree roots and rare plants. The Dog Hill area, overseen by a K9 Committee, gives four-legged friends a place to romp around and running water to help them cool off. A group of conservationists established the non-profit Nature Centre to marshal volunteer stewards of the park’s environment and educate people about the ecosystem inside it. One volunteer group built a meditative labyrinth in the park; the Canadian Stage theatre company has been performing Shakespearean plays in an amphitheatre since the early 1980s; people grow vegetables in community allotment gardens administered by a volunteer committee. ). Originally the performers were just standing between trees next to a hill, but the High Park Amphitheatre built in the late 1990s now seats 1,000 and has a permanent stage. 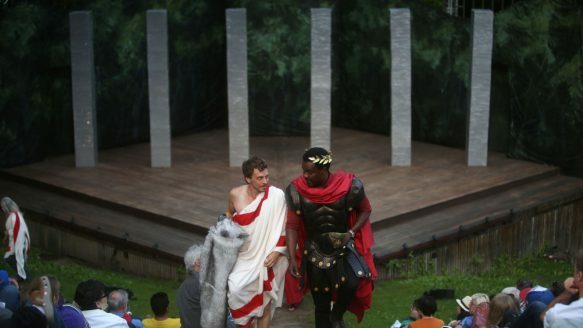 Here, a theatre group performs Julius Caesar on a warm evening in July. The list could go on quite awhile. Chess club. Tennis club. Shinny hockey, and so on: I counted at least 23 different formal, active groups of park users, without even getting to the informal crowds of regular visitors who make a scene just by showing up b those who spread out on the hill near Grenadier Pond on summer afternoons, or who skate on the pond in winter. 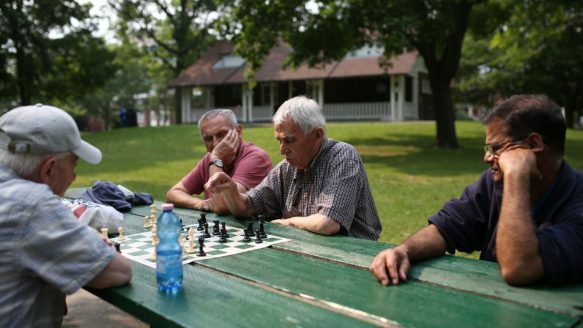 Checkmate: Joe Cindric plays chess against Mike Ziminski as members of the High Park Chess Club gather for a game on the picnic tables outside their club house in Toronto’s High Park. The club has been meeting in their Chess House near Bloor Street b a renovated tool shed b for 33 years. It is the simplest thing b blindingly obvious once you notice it b but worthy of recognition: it isn’t the landscaped space that makes a park a glorious place, it is the work and activity of the people. An essential truth about the city, found within a park. Bird returns zoo after a long weekend out on the town. The High Park Zoo says the Toronto peacock has returned to the zoo, and is currently in the bison pen. Days after its escape from the High Park Zoo, Torontobs missing peacock is finally back home. The peacock’s dash for freedom was the subject of widespread interest late last week, with photos and videos of the bird’s run through the city captured by locals and media. Toronto Animal Services initially attempted to capture the bird, but eventually decided to wait for it to return on its own. Just after 8 a.m. Wednesday, the zoo confirmed on Twitter that the peacock had indeed returned. but will hopefully fly back to his own shortly. Sarah Doucette (open Sarah Doucette’s policard), the city councillor for Ward 13 who sits on the board for the Friends of the High Park Zoo, said the bird returned overnight. Doucette said. She added that the zoo hopes to get the bird back into the aviary enclosure later Wednesday. and that staff would be keeping a close eye on the aviary Houdini. The zoo took steps to bring the peacock home, including playing pea hen sounds in the area (it’s currently mating season) and placing food around the park, not just in the zoo. I had a feeling he’d go home, I’d been saying that since day one. I had faith in him,” Doucette said. TORONTO – Staff with the city of Toronto are planning to set out feeding stations in local parks to attract a peacock that’s been on the loose for days. 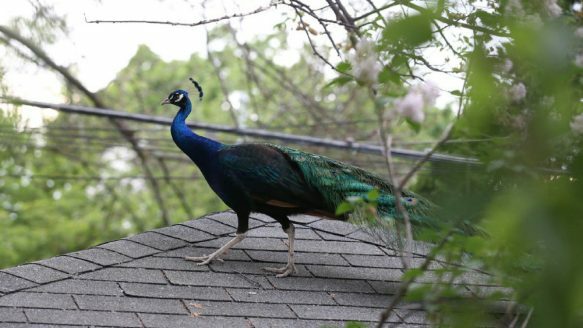 The colourful bird escaped the city’s High Park Zoo on Friday and caused a stir as it was seen jumping from rooftop to rooftop. Animal control officers previously tried to capture the bird using blankets and nets but stopped actively pursuing the peacock on Saturday because they were afraid of driving it further away. A city spokeswoman now says the plan is to draw the peacock to a feeding station so he can be contained. Nancy MacSween says the bird is frightened by all of the attention it has been getting. Residents who see the bird are being asked to keep their distance and notify the city. A peacock that escaped a west-end Toronto zoo earlier this week remains on the loose after it was spotted in the Parkdale neighbourhood Friday afternoon. CTV Toronto videographer Tom Podolec found the feathered fugitive near 88 MacDonell Ave. located in the area Lansdowne Avenue and Queen Street West, shortly after 4:30 p.m. Friday. The bird originally flew its coop at the High Park Zoo on Wednesday, but was coaxed back into its pen the following day, only to escape again Friday morning, a spokesperson with Toronto’s Parks, Recreation and Forestry department told The Canadian Press. A peacock that escaped a west-end Toronto zoo earlier this week has been spotted in the Parkdale neighbourhood. 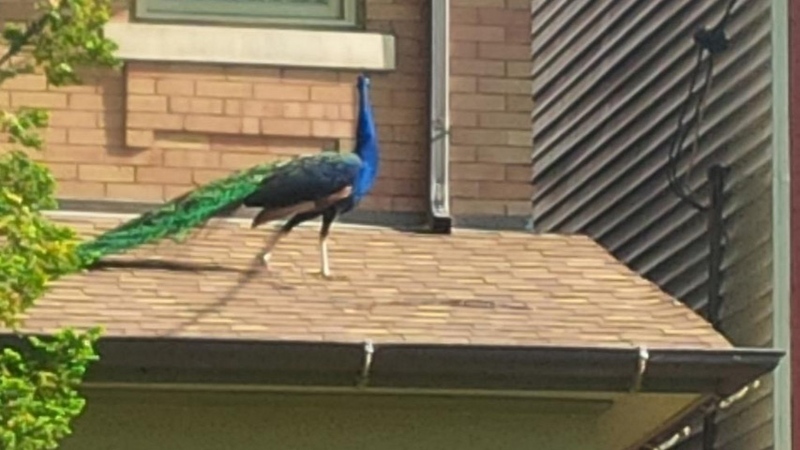 A peacock perches on a Toronto roof as seen in a photo posted to Twitter by @IainMcTO. The zoo’s supervisors are aware of the escaped bird, but are not involved with the hunt to capture the peacock. Toronto Animal Services spokesperson Nicole Ware said the city’s animal services and parks departments are leading that effort. 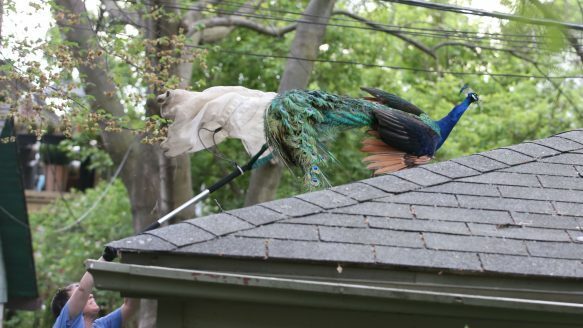 Ware said that animal services have assisted in capturing other escaped animals from High Park, but this is the first time theyb re dealing with a runaway peacock. 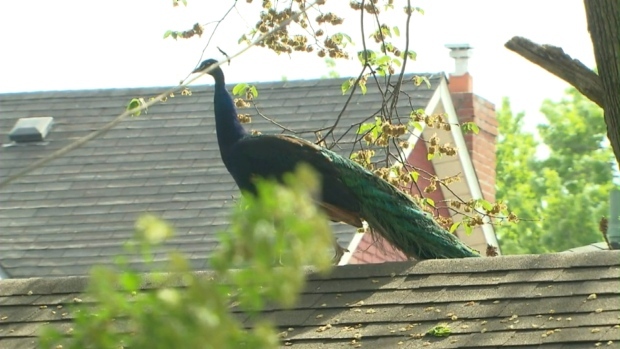 Earlier on Friday, Toronto resident Rebecca Davies told CTV Toronto she’d seen the flashy fowl on Garden Avenue, in the area of Roncesvalles Avenue and High Park Boulevard. 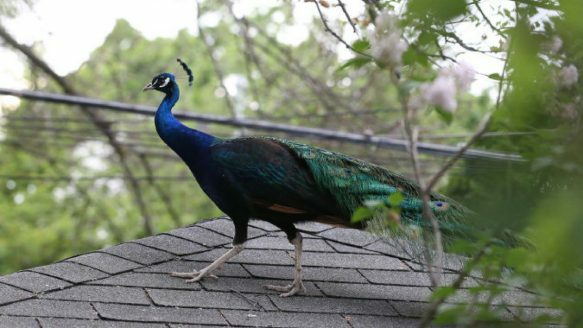 “I came out and saw the peacock up there on my roof,” she said. She said she helped track it for a while and followed the bird out to Roncesvalles, trying to keep it away from traffic. She saw it fly to the east side of Roncesvalles before disappearing. Other residents of the city took to Twitter on Tuesday, Wednesday and Thursday to report sightings in the same area. By Friday morning, the big, blue bird had its own parody Twitter account. “Tom, youb ve stuck around for longer than most of the Peahens in my life. Thanks, bro. #feathertap,” @TorontoPeacock tweeted at CTV Toronto’s Tom Podolec Friday night. High Park Zoo is home to five peacocks and eight peahens that live in an enclosure surrounded by three-metre high fences. Ware warned those in the area not to approach the bird or try to feed it. Anyone who sees the runaway is asked to call 311 to report its location. Just shy of 400 acres, High Park is among Toronto’s largest downtown green spaces. The gently undulating landscape is home to a river, a lake, a zoo, a famous grove of Japanese cherry trees, even a historic homestead complete with the tomb of its former owners. 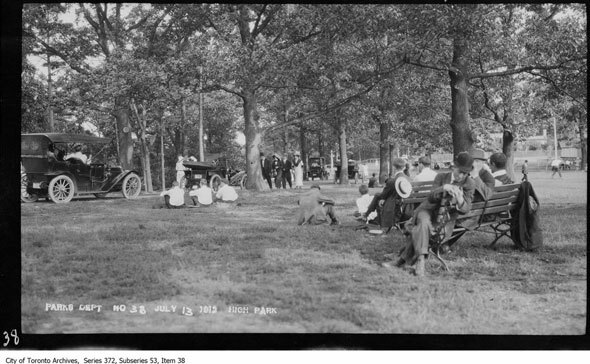 Those departed former residents were the Howards, and Toronto owes the existence of High Park to them. John G. Howard, an architect and city surveyor, owned a sprawling sheep farm on the property with his wife, Jemima, until 1890. 17 years earlier, in 1873, the Howards cut a shrewd deal with the city that dictated the land become a public park upon the demise of the couple in exchange for a downpayment of $300 and an annual, tax-free pension of $1,200, payable as long as one of the pair remained alive. By the time John G. died in 1890, the city had paid more than $20,000 to the Howards. Somewhere upwards of half a million dollars in today’s money. The terms of the deal also stipulated that the Howards tomb, which is just outside their former home, Colbourne Lodge, be maintained with frequent coats of fresh paint and varnish in perpetuity. 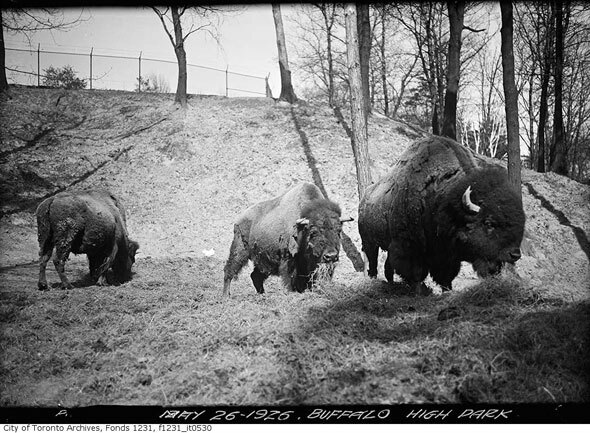 The land was also to be called High Park. 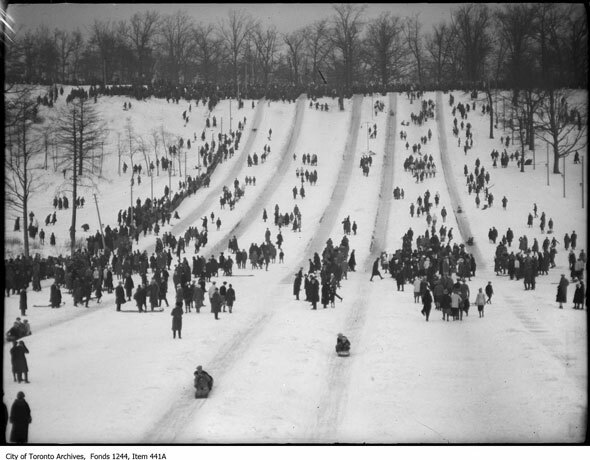 Here’s a look back at what High Park used to look like. 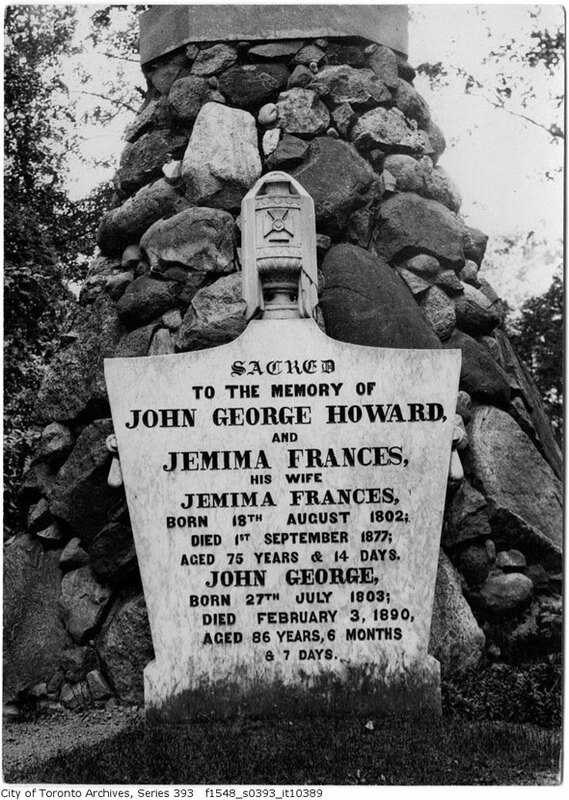 The grave of John George and Jemima Frances Howard near Colborne Lodge. The iron fence surrounding the Howards’ resting place was sourced from St. Paul’s Cathedral in London, England. Their will also stipulates that the gates to the headstone be kept locked. 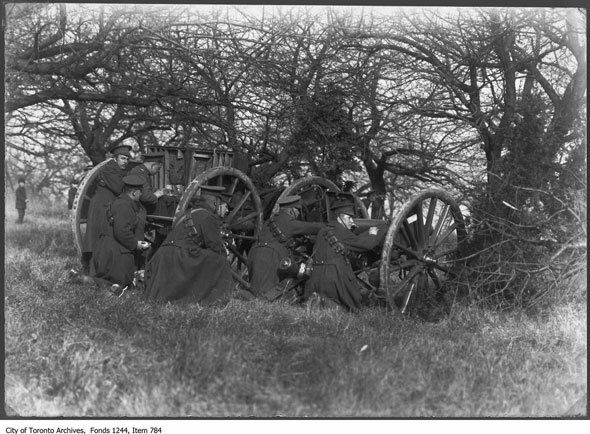 During the first world war, the natural expanse of High Park was used as the backdrop for military training exercises. 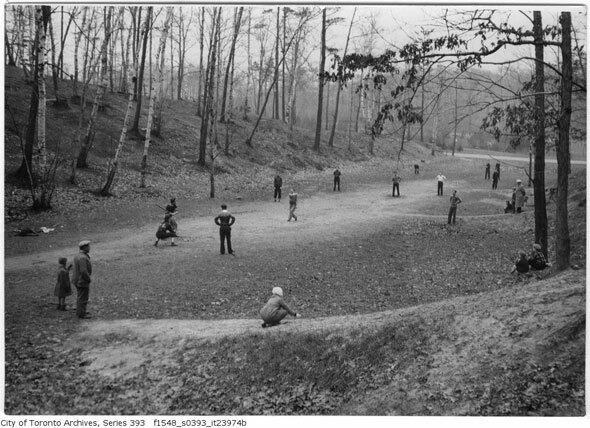 A makeshift baseball game in April 1933. According to the caption, there’s a goat somewhere in this picture. 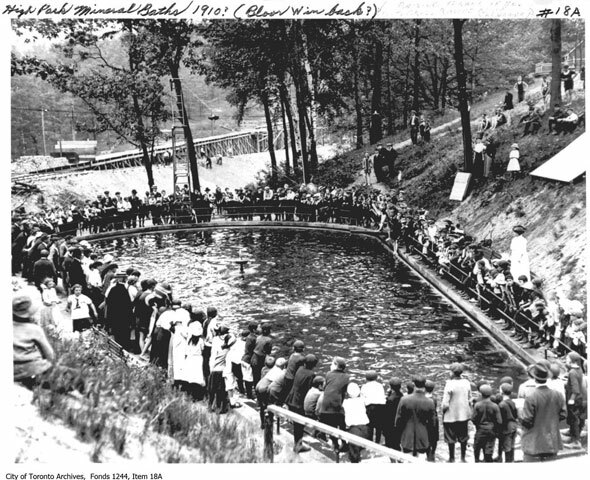 The High Park Mineral Baths, nicknamed “The Minnies,” were located north of Bloor in a natural swimming hole. In the background a deep ravine is being filled in for an extension of Boor St. 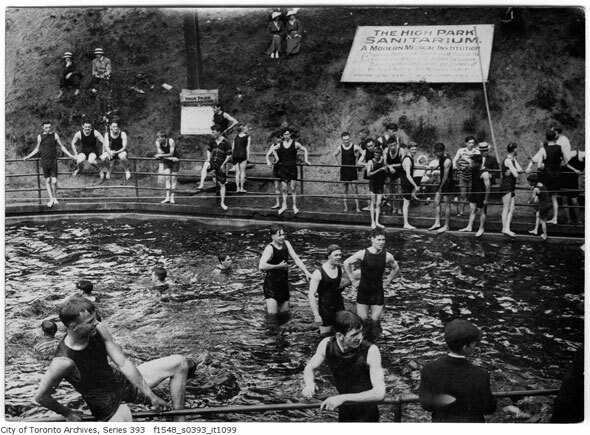 The spring-fed pools were operated as the High Park Sanitarium by Dr. William J. McCormick, who claimed a dip in the water would prevent illness and boost the immune system. 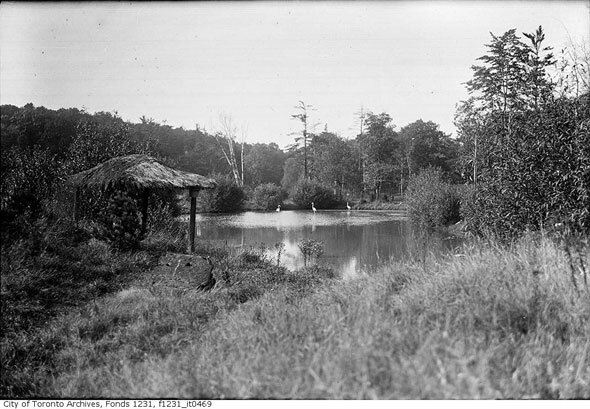 The natural pools were cleared during construction of the Bloor-Danforth line. 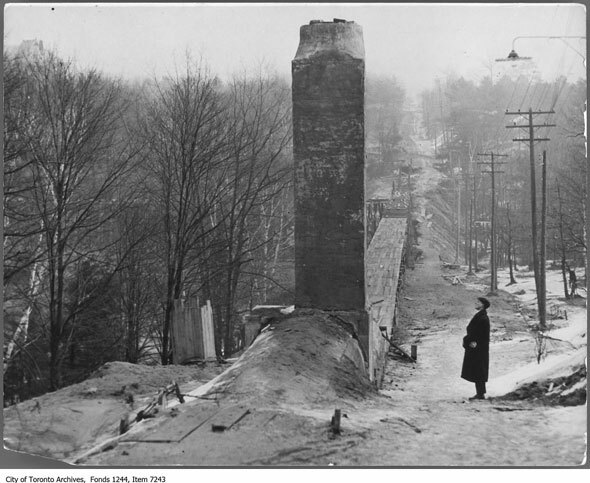 The depth of the manhole cover shows just how much fill was required to push Bloor through the ravine north of High Park. 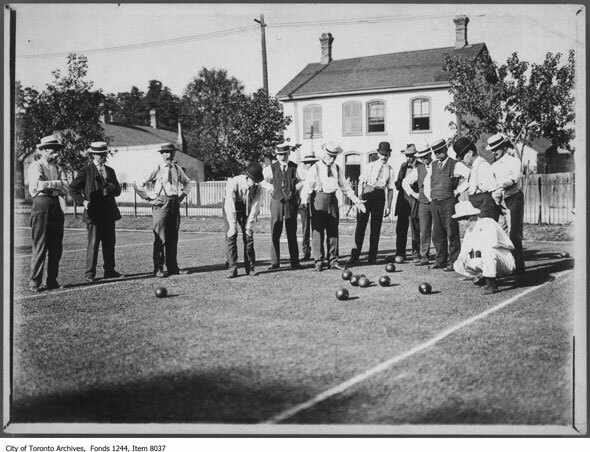 A genteel game of lawn bowls in High Park in 1908. 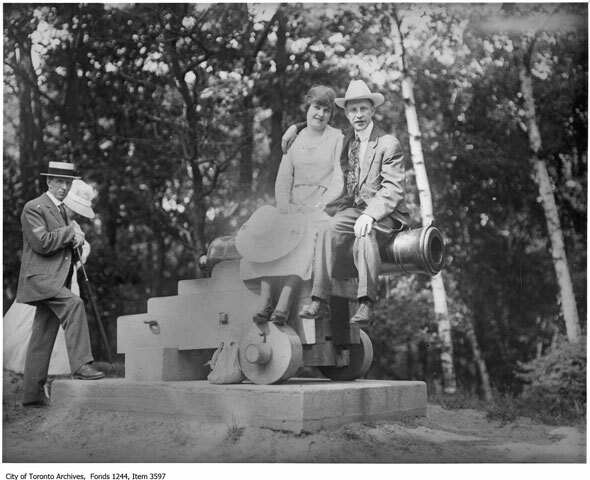 A couple poses on top of a historic brass cannon outside Colborne Lodge. The weapon was made in 1845 and can still be found in the park, despite damage by vandals. 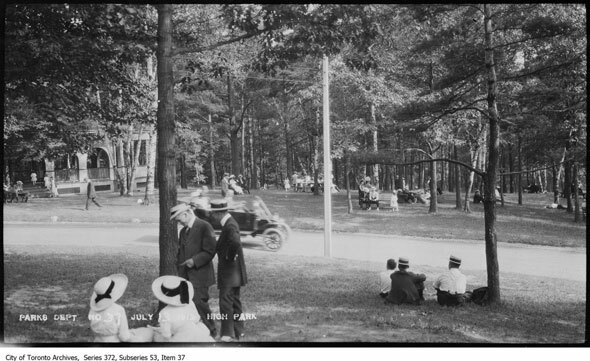 Vehicles in High Park in 1913. 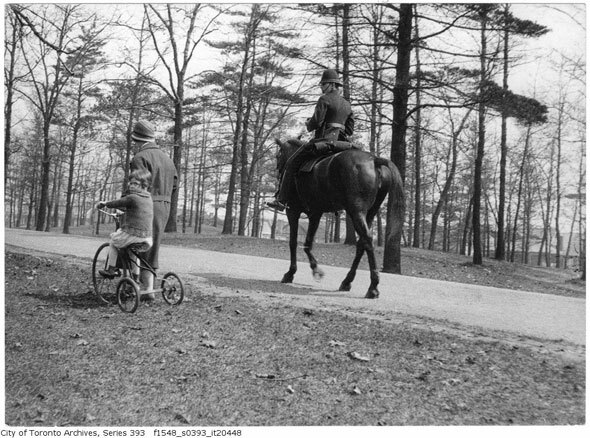 The park’s roads were popular with recreational motorists in the early 20th century. 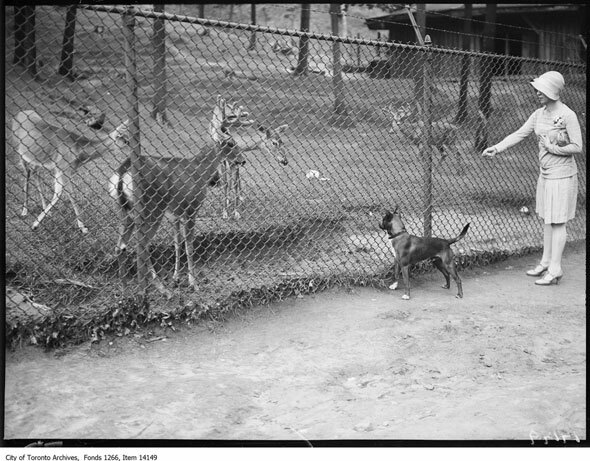 A dog, “Tinker,” meets a caged deer in July, 1928. 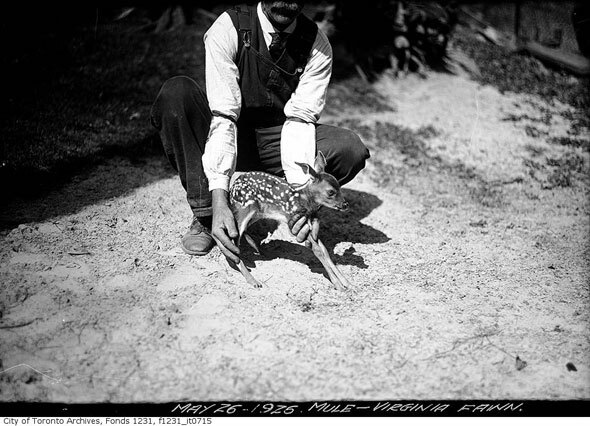 A mule deer fawn at High Park Zoo in 1925. 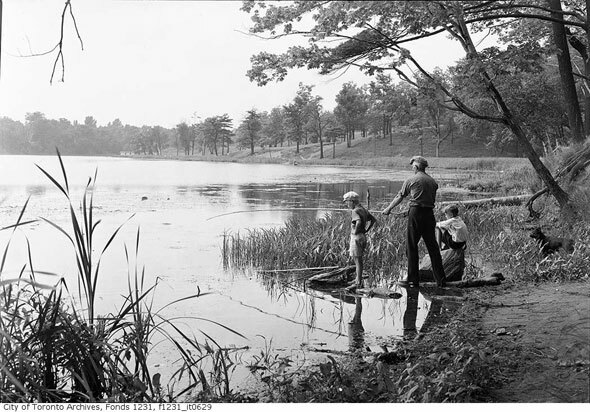 Fishing in Grenadier Pond in July, 1939. Those birds in the distance are flamingos. 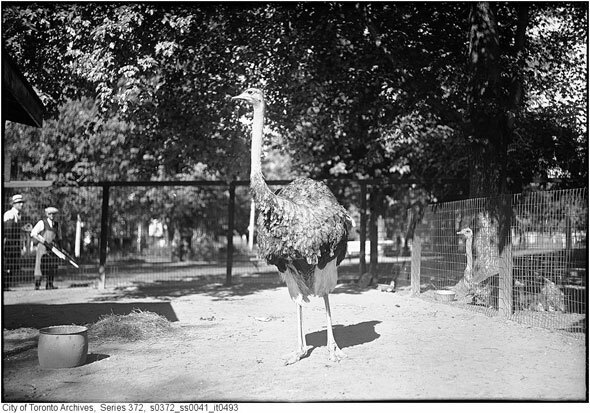 An ostrich in High Park Zoo. 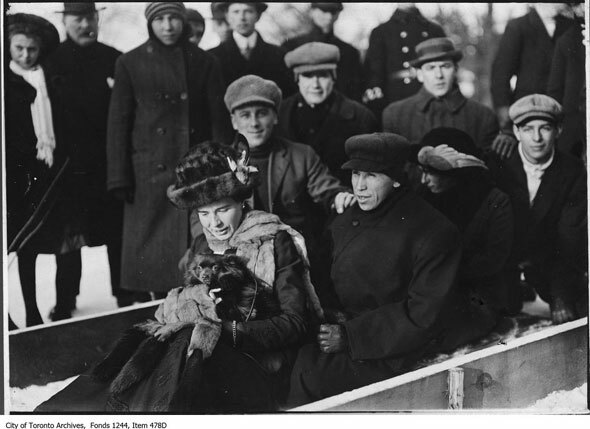 Athlete Tom Longboat in a toboggan in High Park in 1909. In 1907, Longboat came to national attention by winning the prestigious Boston Marathon, smashing the record for the course by almost five minutes. During the first world war he served as a dispatch runner in France. Mounted police officer in May, 1926. Students at the Forest School in High Park. 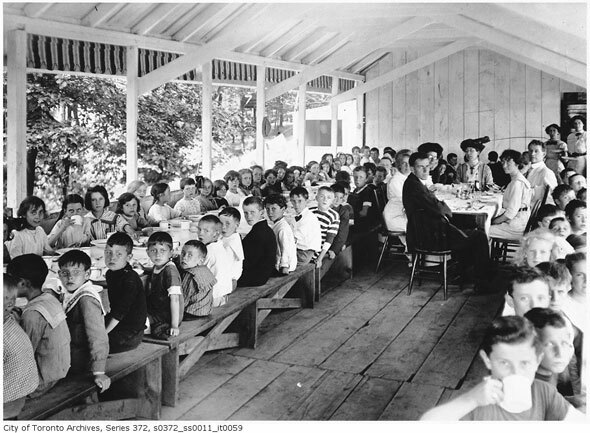 The mostly outdoor facility served as a summer school for under-nourished children. 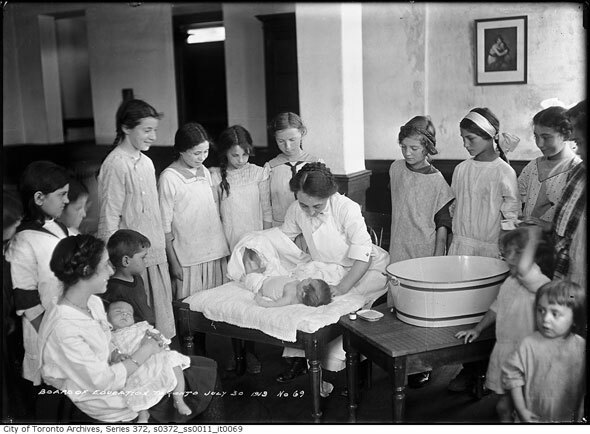 “Here the repairing of wasted little bodies is a matter of prime concern to the staff,” the Globe wrote in 1922. 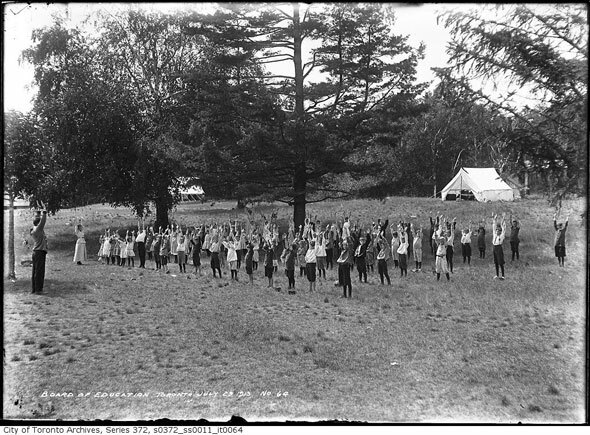 The Forest School had outdoor exercise sessions, classes, even nap times. Rows of cots were arranged under the trees during warm summer afternoons. 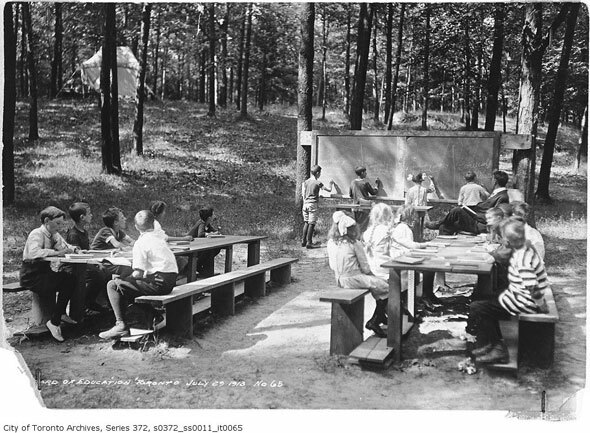 A “little mothers” class at the Forest School in 1913. Meals were served in a large open-sided pavilion. The main building of the Forest School is still standing off Colborne Lodge Dr. at the north end of the park. 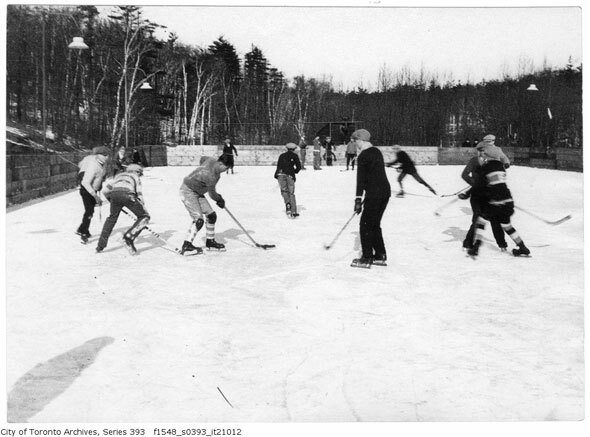 Hockey on a frozen pond in High Park. 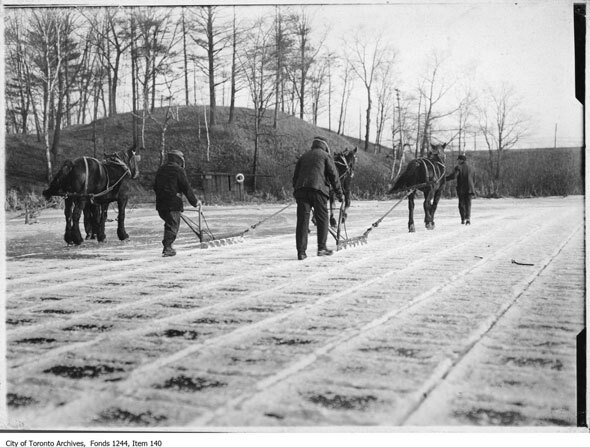 In the days before domestic freezers, ice was cut from the surface of large bodies of water, such as Grenadier Pond. Another popular source of ice was Lake Simcoe. 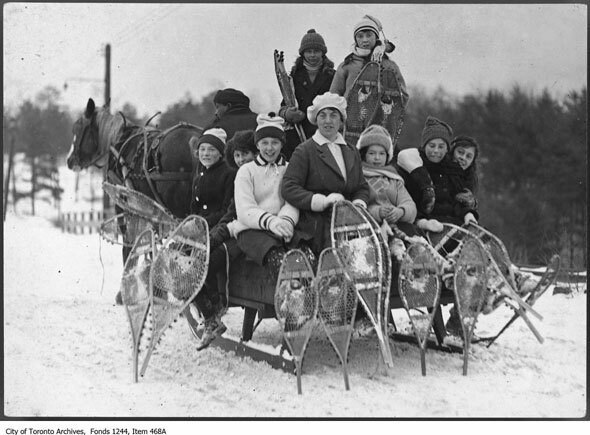 Snowshoers crowd a horse-drawn wagon around 1920. 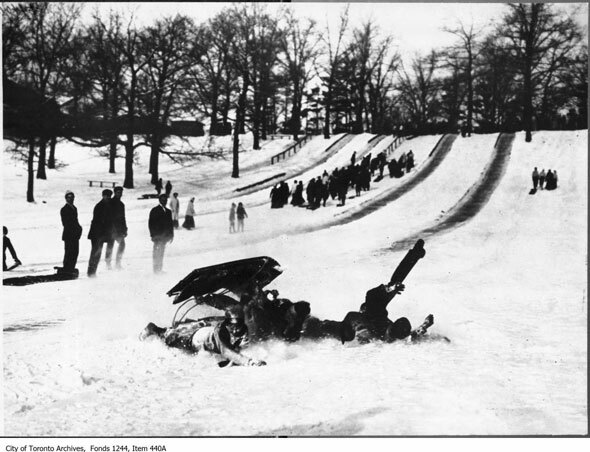 The hills of High Park made for excellent toboggan runs. In summer the same tracks were used for motorcycle hill climbing competitions. Among the other feats of human achievement, runners set five Guinness World Records at the Toronto Waterfront Marathon on Sunday. 1. Lindsay Santagato set the record for fastest marathon (female) in a firefighter’s uniform, at 5:38:51. This was her third marathon and first record. Santagato, 21, is a volunteer firefighter and graduate of the Ontario Fire Academy. She beat the old record by an hour and eight minutes. She was raising money for the Canadian Liver Foundation in honour of her brother, who died of liver and kidney failure, she said. 2. Bridget Burns set the record for fastest marathon dressed as a zookeeper, at 4:08:17. This was her sixth marathon and second record, after claiming the title in the GoodLife Fitness Toronto Marathon dressed in full boxing gear. As well as wearing her uniform, Burns carried a stuffed animal for the entire race this year. She raised money for Friends of High Park Zoo. 3. Jeremiah Sacay, 26, of Toronto set the record for fastest marathon dressed in a baseball uniform, at 3:47:35. He works as a registered nurse at Mt. Sinai Hospital in Toronto. joggling a combination of jogging and juggling three balls b at a blistering 1:20:40. He already holds the title for fastest marathon and fastest 10K while joggling with three objects. His run raised money for People To People Canada, which helps AIDS orphans in Ethiopia. Hetherington set the record for fastest half-marathon dressed as a superhero, at 1:17:30. He also holds the record for the fastest full marathon dressed as a superhero, at the Toronto waterfront race in 2012. He and his supporters raised more than $27,000 in donations for Hands Across the Nations, which will go toward building a school in Doneguela, Mali.